For instance, Fujifilm Corp shut down their motion-picture film factory last year, leaving Kodak as the only major company left producing film. And Kodak’s own sales of motion-picture film have still plummeted, falling 96% since 2006. To put it into perspective, they’ve gone from selling 12.4 billion linear feet in 2006, to an estimated 449 million for 2014. 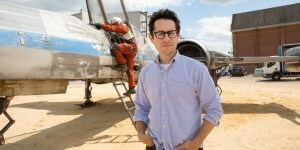 Now, Abrams is filming Star Wars: Episode VII on film. Set for release in December 2015, it’s one of an ever shrinking number of movies being shot digitally. Ironically, the digital revolution in Hollywood began with Star Wars. In 1997, when George Lucas was filming Star Wars: Episode I – The Phantom Menace, he was shooting on film. But they wanted to test out what it would be like to shoot digitally, and there is one shot in the final film that was done as a test. (Know which one?) The Phantom Menace was also the first movie played on digital projectors. Three year’s later, in 2000, they shot Star Wars: Episode II – Attack of the Clones digitally, from beginning to end. Mr. Abrams spoke from the movie’s London set about why he still believes in film and why he lobbied major studios to help keep it alive. WSJ: Why does preserving film matter to you? Haven’t digital cameras become just as good as film? Mr. Abrams: I’m actually a huge fan of digital as well. I appreciate how that technology opens the doors for filmmakers who never had access to that level of quality before. However, I do think film itself sets the standard for quality. You can talk about range, light-sensitive, resolution—there’s something about film that is undeniably beautiful, undeniably organic and natural and real. I would argue film sets the standard and once it’s no longer available, the ability to shoot the benchmark goes away. Suddenly you’re left with what is, in many cases, perfectly good but not necessarily the best, the warmest, the most rich and detailed images. WSJ: You’ve shot your movies on film even though they’re full of effects and, essentially, digital creations. Mr. Abrams: Especially on movies like “Star Trek” and “Star Wars,” you have so much that will be created or extended digitally and it’s a slippery slope where you can get lost in a world of synthetic. You really have to keep away from that, especially with “Star Wars,” which I wanted very much to feel like it is part of another era. WSJ: Is this just forestalling the inevitable death of film? Or will it be like vinyl—an older medium that stays alive because certain purists prefer it? Mr. Abrams: I’m very grateful to Kodak for keeping the lab open for now. As a filmmaker, you want to have every tool available. That doesn’t mean digital doesn’t have huge advantages, nor that I wouldn’t want to experiment and shoot digitally on something. I would hope filmmakers who are just getting started will be able to have this as an option as they continue in their careers because movies are nothing if not a romantic experience and film is a big part of that.